I’m sure I’m not alone in that I’ve put recipes on the blog and sort of forgot about them, am I? I like to make new things and that quest will too often mean something that deserves being made again goes lacking. This is a great example. On this ‘Wayback Wednesday’ I have to share this Goat Cheese Salad with Raspberry Dressing that I haven’t made in too many years. A gift of some goat cheese brought it to mind recently and the purchase of an abundance of raspberries sealed the deal. 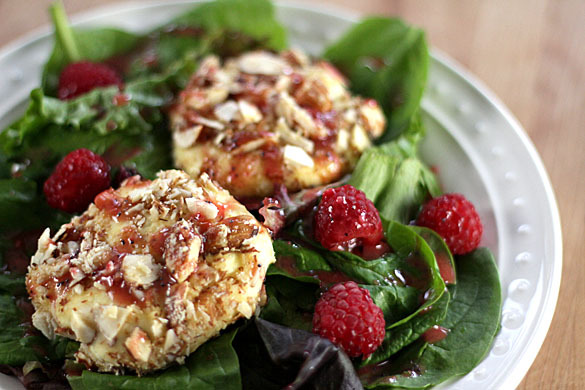 This salad trifecta of goat cheese, sliced almonds and fresh raspberries are perfect together. So simple, so beautiful and so very good. I love the blend of tastes and textures with the soft cheese that is baked with a crispy coating of almonds and then drizzled with a sweet/tart raspberry dressing. When I first transferred this salad from my original food website to this blog a couple of years ago; I did a search to see if I could find the original recipe. If not something gleaned from a recipe card (in the ‘olden’ days, people put recipes on index cards and stored them in boxes…it’s true!) then often the recipes I loved and posted were from either Gourmet or Bon Appetit magazines. I was delighted when my search discovered the exact recipe at Bon Appetit, one of their reader requested RSVP recipes from the August, 2001 issue. I guess I have been making this for awhile haven’t I? Even then it seems my tendency to have to change ‘something’ was at play; it was simple revision but I love the addition of fresh berries scattered on the salad with the goat cheese. Either way just a perfect salad and I love it alone but for a more robust dinner, it’s great served with grilled salmon or chicken. Crisp lettuce is topped with a crunchy and creamy round of goat cheese and finished with raspberry dressing. Blend first 7 ingredients in processor. With processor running, gradually add oil. Add poppy seeds and blend 5 seconds. Pat each goat cheese slice to 1/2-inch thickness. Whisk egg and 1 tablespoon water in small bowl to blend. Place flour in another small bowl. Place almonds in shallow dish. Roll goat cheese slices in flour, then dip into egg mixture, then roll in almonds to coat, pressing gently to adhere. Place cheese in glass baking dish; drizzle lightly with butter. Bake until almonds are lightly browned, about 10 minutes. Divide mesclun greens among 4 plates. Top each with 2 warm cheese slices and fresh berries. Drizzle with dressing; serve. I love this combo. Obviously, living in France we eat warm, creamy goat cheese – breaded or baked – on salads but I love the fruity addition of raspberries both whole and in the dressing. Gorgeous and what a festive lunch, really…. kicks up the same old goat cheese salad! Mmm…I love goat cheese on salads! This looks divine, especially with the raspberry dressing. Delicious!! I still have my recipe cards and many of them have drips or slobs all over them. My favorites are the ones in my father’s handwriting of recipes I’d written home about. Your salad with the addition of berries looks smashing. I feel like all I eat during the Summer time are salads 🙂 Here is another one I can add to the list 🙂 Looks so good. Lovely, lovely salad with beautiful flavors! This and your avocado-orange salad posted recently are two winners and much appreciated additions to my salad recipe collection. Love your Wayback Wednesday feature! And love this salad — goat cheese in anything sure gets my attention. Lovely dressing, too. Thanks for this. That looks totally delicious and amazing! It is going in my to make and eat list! Thanks Barb! Went to the store for goat cheese, got it =) BUT ended up eating goat cheese on crackers with pear relish. I liked the pear relish so much, I think I learn to can things this summer. Now I am going to spend time looking for canning for beginners articles. You are so very right though. The tang of goat cheese pairs very well the sweet of the relish. Made me chuckle out loud. There will be another day I’m sure but pear relish sounds divine. Barb, I love this combo – and your photos are absolutely stunning! I want to crawl right in there with the crusty, melty cheese! I think goat cheese goes amazing with salads. I like it with beet and oranges and arugula. I’ve seen it used with beets a fair amount; combining with oranges sounds wonderful…I’m going to be on the lookout for beets. I did them last year and they so removed the bad taste of the canned ones from my memory bank! I think goat cheese is my favorite cheese and I’ve found so many ways to enjoy it when I cook. The raspberry dressing on this salad sounds wonderful! I need to drag my bottle of raspberry vinegar from the back of the pantry once in a while — or better — try this version! I love this dressing too and admit…I’ve had three of those salads in the last three days…though the vinegar will keep the dressing stable for a bit; I always feel inclined to have to use it relatively fast…or that’s my excuse for eating this salad every day! I have a fried goat cheese salad recipe that I love dearly, and blogged about. It has a poppyseed dresssing. Love having another recipe, so thanks for posting this. I’m liking the baking rather than frying part … and the dressing sounds divine. The oven baking is one reason I love it too Lea Ann and though the recipe calls for it, I actually forgot to drizzle the butter on top and it was fine; I’m OK with saving those calories for something else. There’s nothing better than warm, slightly melty goat cheese on top of a salad! My mouth is watering! I’m pretty certain that this salad was made for me. I LOVE every single element about it and now I’m seriously planning on this for dinner tomorrow. I am so happy you shared this one with us! I feel exactly the same way Jamie; hope you love it as much as I do! You salad looks fantastic. Your photo deserved kudos. Great work on both accounts. Thanks my dear friend; I’ll have to make one for us, how’s that! Encrusted goat cheese? You are calling my name! This salad looks so good and different I might forget I was eating a salad. Yum! Made me chuckled. I will never call you Leslie. Encrusted goat cheese it is! How refreshing, colorful and healthy that platter look! Love the fruit and cheese combo in summer. Thank you Sanjeeta and consider me lucky OK. I have just enough cheese leftover to have another salad tonight. I LOVE leftovers! Gasp! I love this idea…I’m always looking for little goodies to add to my salads to make them more exciting! Thanks for sharing!!!! I’m so glad it’s appealing to you. The end result is simple, beautiful and tasty. What more could we ask for right? This post makes me want to start a new blog and just post my all time favorites. Guess I could do a post about that. Love how the first picture highlights the dressing! Oh I just run them all together in this one space. New, old and all those in between! I will never get everything I had done for the other blog replicated here but sometimes they are such a favorite I have to make sure I do. Like this salad! I love breaded and seared cheese, especially goat cheeses. This is one breathtakingly beautiful salad. By the way, Goat challenge? Is there anything left that hasn’t been turned into a challenge? So, I was thinking of starting up a Liver Wednesday…. 1. Book trip to Asian mountain village. 2. Find yak and figure out how to get back to US. 2. Give up and do something easy like climb Mt. Everest. I don’t think you could have captured a better picture (s) of this salad than what you have posted. It is delicious looking! Thanks so much Paula. You know everyone has an idea of how it should be done but it’s such a thoroughly individual thing. I like seeing the food; up close and personal. Guess this is Barb’s style, huh? You are always so sweet; it’s very appreciated! Those look fabulous! Loving the goat challenge =) Hoping to get some soon!! Should be fun Alan…I know where to get my goat but don’t have a clue what I’m going to make so it’s a challenge for sure! Delightful! I have made something similar in the past but the goat cheese was pan fried. This sound so much easier and less messy. Oh yeah…SO much easier. I even put a piece of foil in the dish I bake it in…no cleanup at all! This looks right up my alley Barb. As our weather hits summer stride, I can’t bear the idea of turning on my oven and am swimming in greens and fresh fruit. Glad your brought this recipe into new light! This would be perfect then Toni…this is my favorite combination because I so love raspberries but I’ve also done it with strawberries and that runs a very close second. I’ve changed my schedule the past couple of weeks and make food in the morning when it’s cool so I did put this in the oven for the short period required but I wouldn’t hesitate to try it in my grill with ambient heat. I’m doing that more and more. Seems only thing I haven’t done there are baked goods! That is a lipsmackingly good combination! A delightful dressing. Thank you Rosa! It is all of that with a little pucker power thrown in!